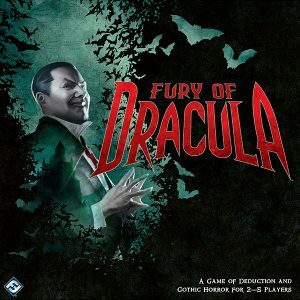 FURY OF DRACULA (3rd Edition) is a one-vs-many cat-and-mouse adventure board game with a great theme. Eight years ago Mina Harker and her companions returned home from Castle Dracula believing that they had definitively banished the vampire Count’s evil presence from the earth. They were wrong. The King of the Un-Dead has now risen again to menace mankind. Throughout Europe wolves are behaving strangely, superstitious peasants are growing fearful, and mysterious deaths are proliferating. Tormented by uncanny dreams and haunting visions of nighttime travel and drinking blood, Mina has rejoined her former companions, now even more determined to find Count Dracula and destroy him once and for all. In Fury of Dracula you undertake their perilous quest, hunting Dracula across Europe and battling him wherever he is revealed. Or you take on the role of the legendary Count Dracula himself as he seeks to thwart these pursuers and plunge the entire continent into an unrelenting and evil darkness. Using a common one-vs-many cat-and-mouse mechanic, four people play the vampire hunters (each with their own specific abilities) while one player plays Count Dracula (who continually releases his evil minions throughout Europe). Using clues and specific abilities, the four hunters must pin down the ever elusive Count Dracula’s location on the board before evil overtakes the land. This game is known for its rich and intoxicating theme. Join us as we dim the lights, pull out the candles, and search the dark alleys of Europe for Count Dracula! The game has a moderate learning curve and requires about 20 minutes of introduction/training. It is worth the effort if you love thematic games that magically pull you into their universe. Watch the videos below to get a better idea of what this game is about and how it is played.